With 18 compressors and more than 60 tools, Metabo offers professionals in different industries compressed air system solutions for numerous applications. 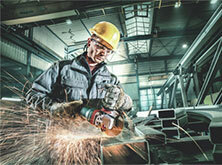 We are the only power tool manufacturer to offer a complete compressed air system for craftsmen. With our robust, powerful and reliable machines you are ideally equipped for any application - from the generation of compressed air and the preparation and distribution to compressed air tools. In addition we offer a comprehensive range of accessories and a reliable service including service and repair. No matter if on the construction site or in the workshop: Our three compressor classes can handle any task. The light and compact starter models of the "Basic Class" are suited for simple commercial applications. On the construction site, our "Power Class" machines provide top performance with maximum mobility. Since the pumps do neither require lubrication nor oil, the power compressors can be transported in all positions. Thanks to the low weight, the compact design and the balanced handle position they can be transported to the work site very easily without requiring much effort. 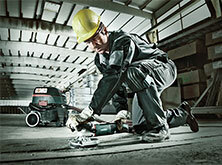 Our "Mega Class" compressors are real power packs for demanding applications in the workshop. Particularly powerful, driven by V-belt and stable, they do not leave any wishes unfulfilled when it comes to uncompromising power. 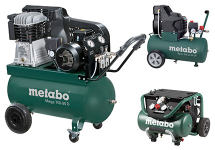 No matter for what compressor you decide: At Metabo you do not get any hot air, but high-quality machines. Our 10-year tank warranty against rusting vouches for this. Professionals on the construction site and in the workshop require powerful tools that can be used flexibly. Our range of compressed air tools fulfills this criteria and ranges from the angle grinder to the drill to staplers and paint spray guns. 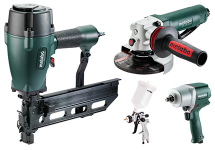 High-quality materials make the Metabo compressed air tools particularly robust and durable. At the same time, our machines are suited for work at hard to reach places thanks to their compactness. The compressed air angle grinder DW 125 Quick weighs for example only two kilogrammes, has, however, a high performance and different comfort functions. Varnish professionals value our paint spray guns with the stepless fine regulation of air volume and work material as well as the flowing change from round to wide jet. This makes precise working even easier. Obviously, we also supply matching nozzle kits and other accessories for every paint spray gun.